I binged this over the weekend myself. It’s an interesting show – I just wish there was a better female presence. El is the eleventh person in the lab’s experiments. We have already seen Kali, a strong illusionist…. there are 9 more to watch out for. There’s actually one , a high school student from the same town who disappeared also…. there’s one from Chicago, then , San Diego, California . I don’t like Kali, though. I think her episode is the weakest in Season 2, ( I find her so annoying ), but this episode is a foreshadowing that she will be going to Hawkins to meet up with El, and hopefully , help in fighting out the underground creatures. Two strong females now….. And Max looks like another strong female presence. Pitbulls are only as vicious as they are trained to be. So I am not surprised that your dog has a sweet disposition. We don’t have Netflix, so I haven’t seen Stranger Things. Other people whom I follow on Twitter have been saying great things about the show. I loved Orphan Black. If you haven’t seen it, I highly recommend it. She has a sweet disposition. Sometimes, too much, it feels like she’s so needy. I love Stranger Things. Normally this isn’t the genre I am into but this is something different, something special, something stranger. It’s special because the main characters are kids. I love that show and cannot wait for season 2! So unique in comparion to other sci-fi shows! Season 2 is on ! ! All 9 episodes of it, complete ! Awesome! I looked earlier today and didn’t see it. I watched it on Oct. 27. Wait, you didn’t see it ? Check out Stranger Things and Beyond. All the episodes are there. I found that there was a bit too much of that (in Season 1 – haven’t started Season 2 yet). I actually need to re-watch it because everyone I know RAVES about the show while I wonder sometimes if it’s over-rated or if I’m missing something. Do you like Black Mirror? Challenge accepted! I shall re-watch some of Season 1 before embarking on Season 2. Shes cute, isn’t she ? E-mail problems. If you are receiving some notifications and not others, it’s probably at your end and not your e-mail provider. I would not wait for the problem to resolve itself. I would shoot off an e-mail to WordPress Support (help@wordpress.com) explaining the problem. It sounds as if some of your settings were changed. However, look at it as a blessing in disguise; you now don’t have to feel obligated to visit people’s blogs since you’re not getting notices. Enjoy it while it lasts. As for Stranger things . . . not my type of show. I have been watching “The Orville” and that’s been a bit hit and miss (it doesn’t quite know what it wants to be) but we’re sticking with it. It’s probably appreciated more by people familiar with the various Star Trek incarnations. Awwww ! Stranger Things is not your type ? Have you watched the first season yet ? That’s an e-mail, by the way, not a site. OK, I’m confused . . . are there notifications showing up in your trash? Or, are you not receiving notifications at all for new blog posts? Those are two different problems. The first would point to your e-mail account as the cause of the problem. The second is likely a setting at WordPress. The key word there is “horror” . . . with very rare instances (none I can think in the past twenty years or so) that’s an automatic strike three situation. Even if I got past that because people insisted it was awesomely and biggly amazingly great, we come to the next part of the description . . .
Aside from the disappearance issue, the key word there is “supernatural” . . . with very rare instances (none I can think in the past twenty years or so) that’s an automatic strike three situation. Add the fact that it’s a series (strike three, again) and that per your own description things don’t get resolved (strike three, yet again) and that they are working on another season (you guessed it; strike three) and we are now up to . . . let me do the math . . . that would be 15 strikes or, if you prefer, five strikes three; two more than necessary to retire a side. Seriously, I’ve heard good things about it as well as some things that as a viewer would just piss me off. I’m glad for people who find it engaging and entertaining, but no, not my kind of thing. And yes, I know that’s hypocritical since I wrote a supernatural-themed short for Halloween, but the advantage of my offering is that it requires no more than a few minutes of one’s time. The other advantage is that few people will read it and rave about it.
. That’s what’s confusing me. I do receive emails notifying me about LIKES and COMMENTS, but no email notifications of new posts of blogs that I follow. In other words, if I get 35 LIKES and 35 comments, I get notified thru email, and the number of emails in my INBOX is 70 emails. Disperser, you’;re overthinking again ! Ha ha ha Just watch it ! Then let me know the verdict. In Reader, you can manage the blogs you follow and make sure notifications are switched on. Go to Reader and click on the “Manage” box next to the “Followed Sites” tag on the left-side menu. Each blog has a setting for Instant, Daily, or Weekly notification. There used to be a general preference setting for notifications which I can’t find right now. But, really, just shoot off an email to Help@wordpress.com and ask them to check your settings and make sure everything is set correctly. At the very least, that will eliminate one unknown and you can then look for other causes. As for watching the series . . . it’s NaNoWriMo . . . gots no time. Oh, OK, I gots the time but not the interest. Besides, if I’m forced to watch it, for sure I’ll be tearing to bits and listing all the stuff that’s wrong with it . . . and no one wants that, right? Give me a blow by blow account of what’s wrong with Stranger Things. Your analysis is always an interesting read. Ha! . . . I see what you are doing; you’re trying to trick me into watching it. See, here’s the thing . . . invariably, horror movies rely on people doing stupid things or acting in stupid ways. In part, that is the nature of horror movies because if they showed you something that scared the bejesus out of you and you had no way to shrug it off and say something like “Well, they were idiots! That would never happen to me!” or “Yeah, that was scary, but real life is not like that!” why, you’d spend the rest of your life having to change your underwear at every strange noise and furtive shadow. For me, it comes down to wanting an escape from all the crap in the world, and that means something where the bad guys get wasted, the good guys win, and the innocents are saved. What I don’t need is made-up stress in my life. Yep, that was a very popular and hilarious ad of Geico. Like, a girl , instead of getting out of the house, runs upstairs and hides in the closet. Or the parent lets the kid to sleep alone in his room, even turns off the light, when the house is clearly haunted Or, like in Slasher, theres a serial killer in the neighborhood, and the main character decides to take a stroll in the middle of the night for a breath of fresh air. And how come characters in a horror movie do not lock their entrance doors ( unless their door locks automatically ) when they enter the house ? I know it’s nitpicking but people do notice these little things. Okay, just read the review in your link. It’s not critical, is it. It’s actually complmentary, . I think the clichés are intentional, though it’s not a parody of 80’s movies of this genre….. I did say you would like it . . . and there’s even a game review. Cute dog. Appears to be a Pitbull/Pikachu mix. Huh ? Is there a Picachu breed ? There are so many questions yet unanswered. 1. Why is there a duplicate of Hawkins underground ? 2. Since Eleven is the eleventh , where are the others ? We’ve seen Kali, of course, she’s the eight. However, I think her arc is the weakest episode in Season 2. I’m aware that her character is being set up for a comeback next season, but her storyline seems off. 3. How did Will manage to communicate via electricity at his house ? 4. In fact, the big question is, how did Will manage to survive underground ? Why did Barb die, and Will didn’t ? Will’s hiding place is very flimsy and can be found easily. It’s funny that Bob’s full name ( Sean Astin ) is Bob NEWBY. As in Newbie, hahaha. And I do ship Steve and Nancy. Alas….. To be honest, I don’t blame Nancy for liking Jonathan. Although Steve is so much more handsome, Jonathan is more my type , as well, the quiet, nerdy type. The main characters ( and the side ones ) look too old to be 3 rd year high students . I don’t recall me and my classmates in HS looking that old. Ha ha The characters in Grease are the oldest – looking high school students , ever. In fact, the main female character was 30 years old already when she played a HS student in Grease. Eeeewww. But hopefully in the interim another series will come in for us to binge on. I am soooooo behind on Daredevil, Jessica Jones, Luke Cage and the Defenders. I love the Defenders ! I haven’t watched each character’s individual series though. But I will soon. …. something to look forward to this winter. I was admonished (by my son no less) to watch each characters story first before going on to Defenders.. LOL I used to watch AHS but this season I just didn’t go for it. Ha ha ha ! My brother was annoyed too. He was here at home last weekend, and I excitedly told him I was watching The Defenders and liking it. Then he asked if I had watched each character’s backstory yet, and I said no, not yet….. and he was like, that’s not the way to do it! ! Ha ha As if there are rules to follow. Me again. I seem to be reading your posts back to front which may seem a bit odd I know, but sometimes real life can distract you from blogging 😦 Anyway, I don’t even know about that series, and although I go on Netflix a lot, they have different programmes on in the UK than they do in the States. I did get very hooked on a thing called “Madmen” not too long ago and sat watching it all weekend and beyond. Shameful I know. No Stranger Things in UK ? A friend from Sweden has that on his Netflix. Try to look for it again Sometimes it’s hidden. Or look for it on Netflix Originals. Stranger Things 2 was a blast—it wasn’t as strong as season one, not nearly I thought, but it was every bit as addicting. I read your article there. Being able to see the future is a gift. If the future that we see is bleak, I think it’s our duty to tweak some events in our lives , especially if it concerns the life of a loved one. We are given a free will not to accept or accept our fate. Otherwise, everything is pointless. Really enjoyed Stranger Things 2. I agree with you the setting is a much simpler time. Love the retro looks the 80’s were actually a good time. 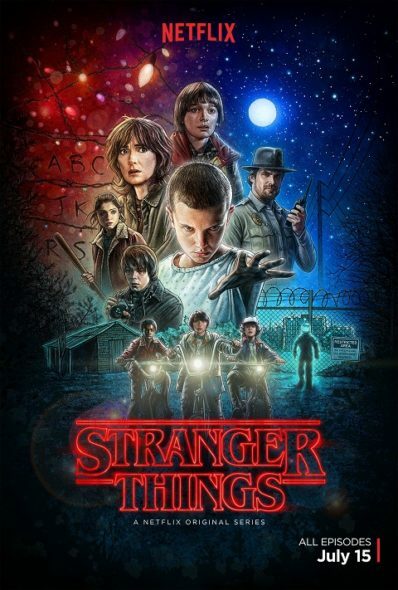 So, firstly, Stranger Things – just watching Season 2 and LOVING it! Extra dimension for me is that I LIVED through that era so I remember it all so well – including the video arcade game they were playing in the opening episode – it was my FAV game back then in the 80s! Secondly, your reference to ‘him who must not be named’ saddens me, it really does. If you want to talk, let me know. Happy to send you my contact details (email or whatever). Pretty certain you’re not going to use and abuse it. Trained counsellor too! Anyway, the door is there Ren. Take care, Ken. The him who must not be named is the crazy president of the United States. Every crazy act of his depresses me. Did you guys catch any ’80s movie references? If not, then check out my post! I loved Season 2 of Stranger Things, however being a proud Generation X cardholder, watching this show is very nostalgic for me. I LOVE the kid actors in this show and I think they do an amazing job. I do think there are some unanswered questions for sure (i.e. HOW did the upside down come to be? Is is just underneath Hawkins or is it going global?) however I didn’t think Season 2 ended with as big of a cliffhanger and unanswered questions as Season 1 did, for everyone seemed to be happy and having a good time at the Snow Ball (reminds me so much of the awkward middle school dances of my youth). I am looking forward to season 3 and I hope I can find more good shows to binge watch considering network TV is poop! Pixel ! That’s a cute name ! Mine is named Taylor.